In our Powerline adapters reviews article, we will show you some of the best models out there. If you live in a relatively large home with thick walls and lots of interferences, then the chances are that there are certain areas of the house where Wi-Fi coverage is insufficient, or you regularly experience dead signals. 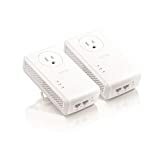 This is usually an annoying occurrence and to combat it, it’s worth investing in a PowerLine adapter and here we have the best Powerline adapters reviews that you can find on the net. A powerline adapter is a simple-to-install digital home technology that is reliable for networking your devices with a connection that in most cases, is faster than Wi-Fi. This adapter works by utilizing your regular power connection for transmission of signals. 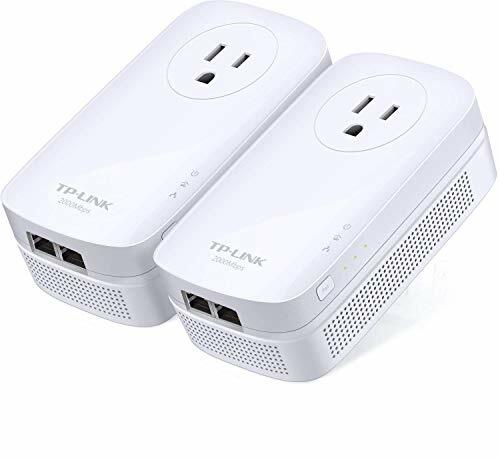 Powerline adapters mostly come in pairs, and all you have to do is plug one into a socket, then connect it to your router using a provided Ethernet cable. You can then take the other adapter to your desired room, connect it to the power supply, and then connect your device using the Ethernet port. However, powerline adapters are not only limited to Ethernet connections, as some of the best powerline connectors come with Wi-Fi capabilities. They can create a Wi-Fi hotspot that will allow you to access the internet while in rooms where your regular signal can’t reach. The major difference between the two is how they function. 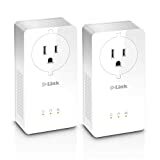 While Powerline adapters use power lines, Wi-Fi extenders or repeaters merely push a weak signal further around the house. This signal can interfere with your existing signal, causing slowness or signal drops. Though less effective, Wi-Fi extenders tend to be more expensive than the less known powerline connectors. You should only opt for extenders if your home has issues with the current powerline networking and you can’t run a physical Ethernet cable. Since acquiring a good powerline adapter can effectively solve your signal problems, go ahead and read our powerline adapters reviews and find some of the best in the market available today! The TP-Link AV2000 kit is widely considered the best PowerLine adapter in the industry. One of the biggest contributors to this is its wide bandwidth that makes the adapter so fast that it has edged ahead of its rivals. However, with the release, TP-Link toned down from the 254 adapters allowed in its predecessor kit, the TP-Link AV1200. Why this was done is not very clear. However, doesn’t bring much effect as eight connectors are still far much enough for larger home. The TL-PA9020P adapter borrows a lot regarding design from its predecessor, AV1200. It comes with the same pleasant rectangular box with rounded corners and a white glossy finish. It remains large enough, just like most other adapters, to cover your extra power socket. However, it makes up for this by having a pass-through outlet that makes up for the covered socket and allows you to connect an extra device. The front side also features a vertical array of 3 LED lights that are responsible for power, Powerline, and Ethernet. This device employs the HomePlug AV standard that uses the 128-bit AES encryption to enable secure communication between all connected devices. This is achieved by pressing the pair button. It also has 2X2 MIMO with Beamforming which establishes multiple simultaneous connections for you to enjoy higher powerline speeds and greater stability. TL-PA9020P performs better than most AV2000 adapters and gives you a decent speed of 122 Mbps in an average home with interferences. There is nothing that we didn't like. This is a very popular adapter, and it is so because of its reasonable price and incredibly fast speeds as well its simplicity and effectiveness. The PLP1200 kit consists of two powerline adapters, a quick start guide and two Ethernet cables, one for connecting to the router, and the other one for your LAN enabled device. NETGEAR's PL1200 is advertised as a “1200 Mbps” adapter. This marketing-speak indicates the PL1200 uses Qualcomm's QCA7500. 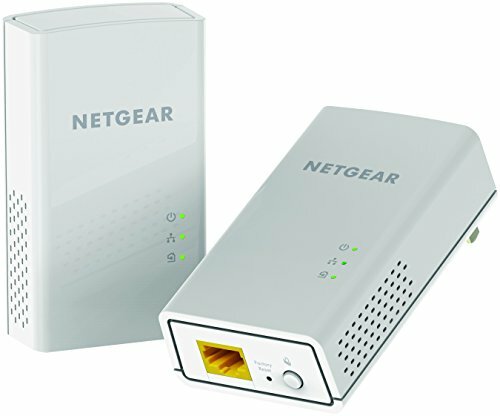 The Netgear PL1200 may not be the most stylish device, but it features a compact design made of plastic with a white color and a glossy finish. This device is slightly bigger than its brother, the PLP1200-100PAS, which also offers you a pass-through socket. This helps you not to lose your electrical outlet in every connected room. The adapter supports tri-color HomePlug link quality indication. The single Gigabit Ethernet port is on the bottom side of the adapter while the Reset and Encryption buttons are on the right. When it comes to performance, this adapter doesn’t deliver the promised speeds of 1200 Mbps. It however still offers greater speeds than 802.11n adapters. It peaks at about 450 Mbps in a simple and close set up and averages 105 Mbps in a house set up. It’s important to note that these speeds are affected by the number of interferences like Microwaves and the distance between the connectors. The D-Link Powerline DHCP-701AV supports the latest AV2 2000 standard and comes with two identical powerline adapters, a quick install guide, and 2 Ethernet cables. It uses Broadcom’s high-performance HomePlug AV2 MIMO chips, and it’s still one of the fastest powerline adapters around, despite having been released at the end of 2014. 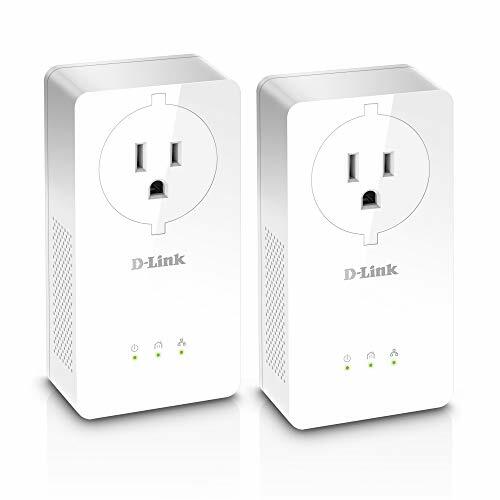 The D-Link Powerline AV2 2000 (model 701AV) features a small and compact base with a white, glossy finish and LED lights that are surrounded by a black bar. It is HomePlug AV2 compliant and uses a 3-prong plug, but it doesn’t have a pass-through option to preserve the number of power sockets in the room. It also has a Reset button, a Simple Connect button and a Gigabit Ethernet port at the bottom. This adapter proves to be an edge above the competition regarding the speeds offered. You will be able to get an average speed of 180 Mbps with medium conditions. Fastest powerline network performance available. ZyXEL connectors are a bit peculiar in that they are not certified by the HomePlug Alliance, despite the prominently displayed HomePlug AV2 MIMO label on their packaging. However, this does not in any way affect their performance, as ZyXEL PLA5456 is one of the best powerline adapters available today. This adapter is based on Broadcom chips and therefore offer super-speedy performance as expected. It also allows interoperability with other Broadcom chip-adapters, even though ZyXEL doesn’t guarantee on operability. The ZyXEL PLA5456KIT adopts the popular white and glossy compact case that we have now become accustomed to when it comes to powerline adapters. It’s bulkier and heavier than the average powerline adapter, but it makes up for this by having a pass-through outlet. On top of that, it features 2 Ethernet ports at the bottom, rather than the one port most adapters come with. This increases convenience as you can connect other Ethernet-ready devices even on the primary adapter. It also features three LED lights that support the tri-color HomePlug link quality indication. Being based on Broadcom chips and the excellent MIMO technology, you can expect this device to perform excellently. In an average home with interferences, it can give you up to 190 Mbps. 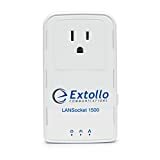 The Extollo LANSocket is another Broadcom chip-based powerline adapter, and it’s a guarantee of excellency in value. The kit comes with two identical adapters, a quick install guide, and two short Ethernet cables. It allows a connection of up to 16 units simultaneously. This adapter features the regular white plastic case but doesn’t have the glossy finish commonly found in powerline adapters. However, that doesn’t matter since this is not a display device. It will be mostly tucked in a hidden corner. 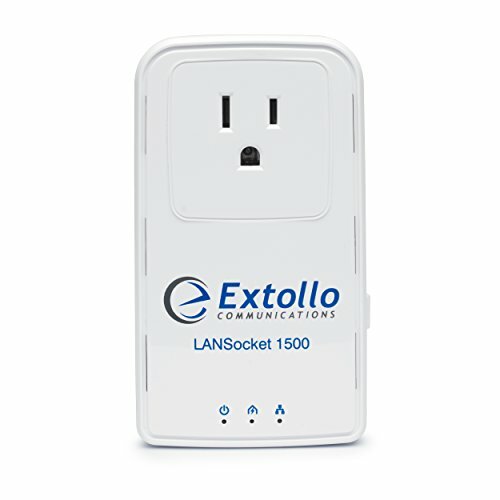 The Extollo LANSocket 1500 uses as 3-prong plug and has a pass-through outlet that allows you to still power up other devices. Just like most connectors, it has the 3 LED lights for Power, Ethernet, and Powerline. These help you know the best place to install the adapter. There is also a sync button on the right side of the adapter that when held for 15 seconds, returns the adapter to factory settings. However, unlike the ZyXEL PLA5456 adapter kit, it comes with only one Ethernet port that is found on the bottom side. This powerline adapter boasts both the Beamforming and the 2×2 MIMO technology. The former is responsible for creating two independent signal paths which help to focus on the transmission to and from connectors primarily. This goes a long way into strengthening the transmission as well as speeds, as the paths follow the route with the strongest performance. Regarding speeds, this is one of the best powerline adapters that you can go for. With regular conditions, it averages around 200 Mbps. The list above features our pick of the best Powerline adapters reviews included. However, before you buy one, it's important to note that the speeds indicated on powerline adapters are usually theoretical and measured full-duplex (meaning both the transmit and receive speeds are counted together). The real-life speeds are usually far lesser than the theoretical ones. However, with the list above, you are guaranteed to still get value for your money.